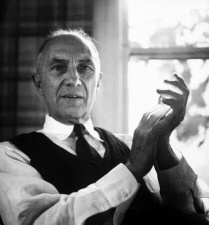 I told William Carlos Williams he couldn't perform at the reading because he was dead. He recommended Randall Jarrell. I didn't have the heart to tell him . . .
WCW portrait stolen from here.